Flat-screen TVs, online shopping and men on the moon? These were all sci-fi fantasies in 1960. Somehow, though, inventor Lee DeForest predicted that by the year 2000 they would all become a reality. Turns out you don’t necessarily need a crystal ball to see into the future. The January 17, 1960 issue of the Sunday newspaper supplement, American Weekly, included a rather forward-thinking article by DeForest, a man they called the “Father of Radio.” In it, he described a world that’s as recognizable today as it was alien 50 years ago. Lee DeForest, by most accounts, was a frustrated man. 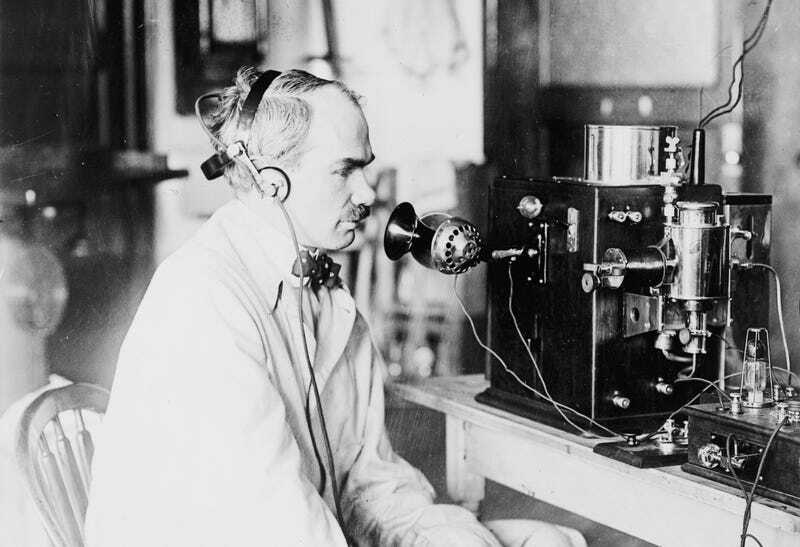 He’s credited with inventing break-through tech for radio, but he never felt like he got enough credit for his contributions. He was rather publicly embarrassed by another inventor for not understanding how his own invention, the audion, worked. You can pretty much imagine him as the nerdy, bow-tied Rodney Dangerfield of early radio. But in his later years (DeForest was 87 years old in 1960), he sure could dazzle with his predictions for our bright and shiny new future. Many of DeForest’s predictions for the future read like they’re straight from “The Jetsons.” But that space age cartoon family of the 21st century wouldn’t premiere on American TV for another two years. Instead, DeForest’s guesses at the future seem to have been pulled from the ether, filled with great promise of the technological future. Not all of his prognostications came true, of course. At least, not yet. Back in 1960, space exploration was still in its infancy. But DeForest predicted we’d reach the moon by the year 2000. He was right (we did it in 1969), although his prediction about establishing a permanent moon base was a tad optimistic. Men will have orbited around the earth and moon many times over. Space platforms outside the earth’s atmosphere will be in use as relay stations. We will have landed on the moon and established a base there. Instrument-equipped missiles will be fired millions of miles into space, and will return to earth with data on the planets and other bodies of our solar system. DeForest predicted that by the year 2000 Americans would see flat-screen TVs hanging on their walls, audible machine translation of foreign languages right over the phone, and even a visual version of shopping remotely. He also hit smartphones very nearly on the nose. You will have portable telephones no larger than a king-size cigarette pack (transistor radios of that size already are being built). Walking down a street in Boston, you can call your family at home, or phone a friend in Los Angeles—or even abroad. A miniature TV screen will let you see the person you are phoning. (By accepting a less-detailed image than that of home TV, we already can send such pictures over telephone wires and narrow radio bands.) You can also see items you may be considering for purchase, from small products to pieces of real estate. When you phone a foreign country, electronic translating equipment, built on the principle of today’s computers, will translate your conversation instantaneously. If, for example, you are calling Japan, answers will come back translated from Japanese. World-wide television, both color and black-and-white, will be common. Atmospheric disturbances never will disrupt it; relays will be possible through communications satellites or use of the atmospheric “scatter effect” which reflects some TV waves over phenomenal distances even now. Miniature TV sets, completely portable, and flat surface sets hung like pictures on your wall will be old-hat. The future of transportation in the 1950s and ‘60s most often involves two things: flight and automation. DeForest offered up both in spades with his automatically driven cars (got ‘em! ), atomic-powered passenger jets (not quite) and ubiquitous (if not Jetsonian, before the Jetsons were even a thing) moving sidewalks. Cars will have “automatic pilots.” After entering an expressway, you can relax and ride an invisible beam. It will keep your car at a safe distance from other autos, and radar automatically will apply your brakes as required. Passenger-carrying helicopters—helibuses—will take you up and over congestion, turning the sky into radar-controlled, multilevel highways which, incidentally, will be much less costly than those on the ground. Inexpensive private airplanes equipped for vertical take-off and landing also will fill the air. Atomic-powered missiles will carry freight and mail between cities—and continents—within minutes. Jets and missiles will be commonplace for passenger flights. Downtown streets will have moving conveyortype sidewalks. They will carry you from one store or office to another—as you sit on a portable golf-type stool if you like. “Cold light” was a promise of the future that dates back to the 19th century, but electroluminescence wouldn’t find common uses by companies like Sylvania and Chrysler until the 1960s. DeForest imagined that these vibrant “cold lights” would revolutionize the feel of our built environment. Electroluminescence, or “cold light,” will revolutionize the appearance of homes, industries, and entire cities. With no heat, shadow, or glare, this lovely “glow” will usher in a new era of comfort and safety in individual rooms, at airports, and on highways. A touch of a button will permit changes of color nuances for entire wall panels. The widespread adoption of nuclear energy and solar powered everything were common predictions at the dawn of the 1960s, but it was DeForest’s insistence that wireless power was the wave of the future which likely most surprised readers of American Weekly at midcentury. Nuclear energy will be a practical power source for industry, autos, ships, missiles, trains, and planes. One “shot” of atomic fuel will last years. even decades. A single atomic battery will produce all the electricity needed for years in homes or factories in isolated regions. Devices which will catch and store energy from the sun’s rays will make solar heating, lighting, and power a reality. Solar energy in some regions may be cheaper and more practical than nuclear power! Some day, too, the need for power wires and such common household items as cords and plugs may have vanished: There is a technical possibility that power can be transmitted directly on invisible beams—and that an airplane, for instance, can be controlled and powered by transmission of a radio and energy signal. DeForest predicted that the office of the future would be overrun with electronic computers — freeing up thousands of workers to find other work that computers won’t yet be able to do. And much like the cash registers of tomorrow, these computers can understand speech. Okay Glass, pay for Tang. Many firms now are drowning in an ever-rising sea of paper work; so is government. Electronic computers will take over vast recording and accounting jobs, freeing tens of thousands of clerical personnel for other responsibilities. The need for expensive models of many new products, from jets to smaller items, will be eliminated: computers can predict their performance under varying conditions in a few hours. You’ll be able to dictate memos and personal letters directly into an electronic typewriter. Already, a rudimentary phonetic typewriter can type a few simple words and phrases as they are spoken into a microphone. DeForest predicted that automation in medicine thanks to the computer will allow for quick diagnosis and cross-referencing of diseases, but it was organ transplants — still not a practical reality in American hospitals of the time — that would’ve read as incredibly futuristic to the people of 1960. Man’s life span will have increased to nearly 100 years. The causes of and cure for cancer will have been found. We will know how to deal with most types of heart disease. The ability to “transplant” certain organs and tissues, new cures for many mental ailments, mastery of crippling arthritis and even most types of headaches and colds—all will be part of medicine’s achievements. The atom and electron will be your doctor’s servants. Electronic “brains,” for instance, will store knowledge of every symptom of every disease, making instantly available to physicians everywhere up-to-the-minute scientific findings which they could never hope to keep abreast of. Despite the amazing abundance of food being produced in 1960, there was a concern that the world couldn’t produce enough food to feed its people. DeForest saw answers to the population crisis in extracting nutrition from the ocean and developing improved methods of farming on land. New discoveries will make the waters of wretchedness recede from every corner of civilization. Our limitless oceans will be “farmed” for nutritive products. Refining of salt water into fresh will be widespread and inexpensive. Striking developments in irrigation and flood control, more efficient use of solar energy, electronic acceleration of germination and growth, and revolutionary chemical and biological discoveries will expand mankind’s food resources so that famine will be eliminated—despite immense population increases. Electronic appliances would reign supreme in the house of the future, DeForest writes. Fast-cooking ovens will prepare meat in a matter of minutes and those dirty dishes will be cleaned by high-frequency soundwaves. Dirt-resistant floors and bug-killing paint will help make the house of tomorrow a sanitized vision of perfection. There will be almost no housekeeping problems. Temperature, humidity, and velocity of air in each part of the home will be kept automatically at comfortable levels, day and night. Smoke, dust, and harmful bacteria will be purged from the air before it enters. The reversible heat pump, based on the principle of a refrigeration unit, will cool homes in summer and heat them in winter. Electronic appliances will do your cooking, dishwashing, and disposal of waste. High-frequency sound waves will clean the dishes. An electronic oven will cook meat in two or three minutes. All appliances can be turned off from miles away by dialing code numbers on your pocket-size radiophone and, thanks to an electronic housekeeping “center,” you’ll enjoy such luxuries as having breakfast ready the moment you get up. Blankets no longer will be necessary indoors; a radiant “canopy” over your bed will replace them. Instead of a picture window, there will be an invisible “curtain” of moving air to divide your living room and patio. A home TV circuit will enable you to look into nurseries or other rooms at the opposite end of the house. New dirt- and grease-resistant floor, furniture, and wall coverings will be available. There even will be a bug-killing paint which, year in and year out, will kill any insects that touch it. Weather control was a hot topic in the 1950s. The U.S. military even imagined that they could use weather as a weapon against the Soviet Union during that Cold War which never got hot. But DeForest saw controlling the weather through a more humanitarian lens — diverting hurricanes or lessening their destructive powers. Thanks to data furnished by satellites,’ as well as the electronic analysis of land, atmosphere, and oceans, climate control will be within man’s reach. We will know how to dissipate storms of hurricane intensity or divert them from their destructive course. We will unfreeze ports which are now icebound. We will be able to predict weather precisely for months and years ahead. DeForest didn’t live to see the year 2000. In fact, he died a year after this article was published. But given all of the things he got right (or at least versions of what he got right) I think he’d be pretty pleased with himself. Even if few people today remember his name.